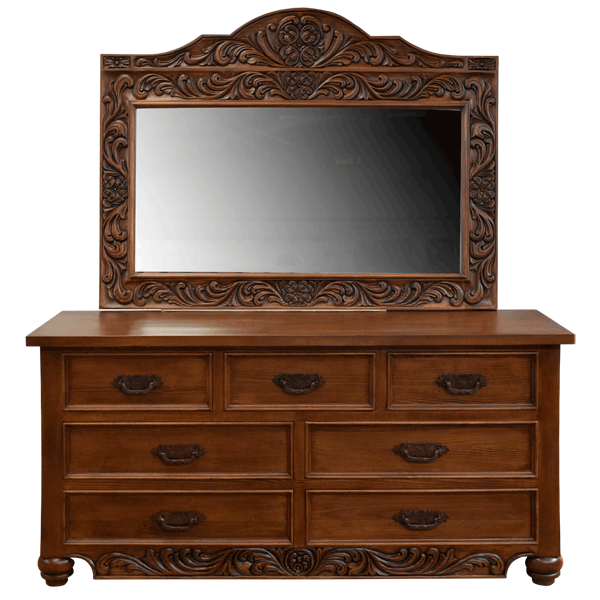 With its large, spectacular mirror and hand carved details, this handcrafted, Western style dresser will be a focal point in your bedroom décor. The dresser features seven, rectangular drawers, with the top, three drawers being the smallest. Each drawer has a hand forged, iron handle in its center. The dresser´s open, wide top has a straight, top rim, and each side of the dresser has a rectangular cut panel decorated with hand carved, floral and scroll designs. The base of the dresser has a solid wood apron with curved ends, and the apron has hand carved, floral and scroll designs. It rest on tapered, bun style feet, and the dresser is finished with a beautiful, brown stain. The dresser is made with the best, sustainable, solid wood available. The frame of the mirror is made with solid wood, and it is embellished with luxurious, hand carved, floral and scroll designs. 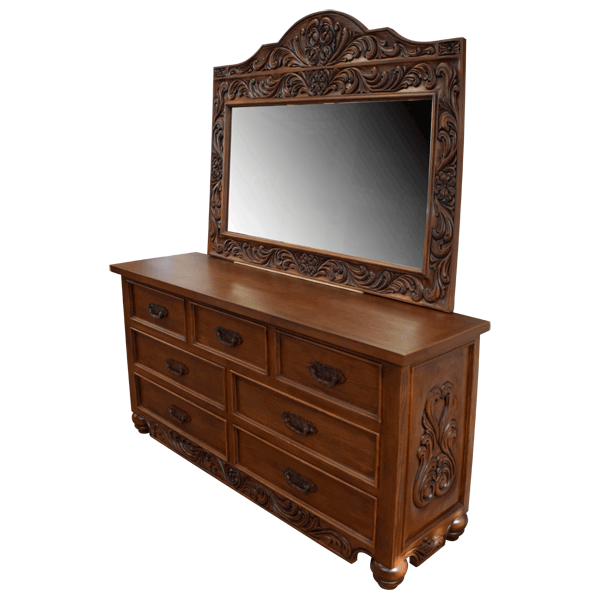 The mirror has a magnificent top crest, which is adorned with exquisite, matching, hand carved, floral and scroll designs. The mirror and dresser are 100% customizable.